Phoenix has long been on the cutting edge of retail, especially when it comes to shopping malls. 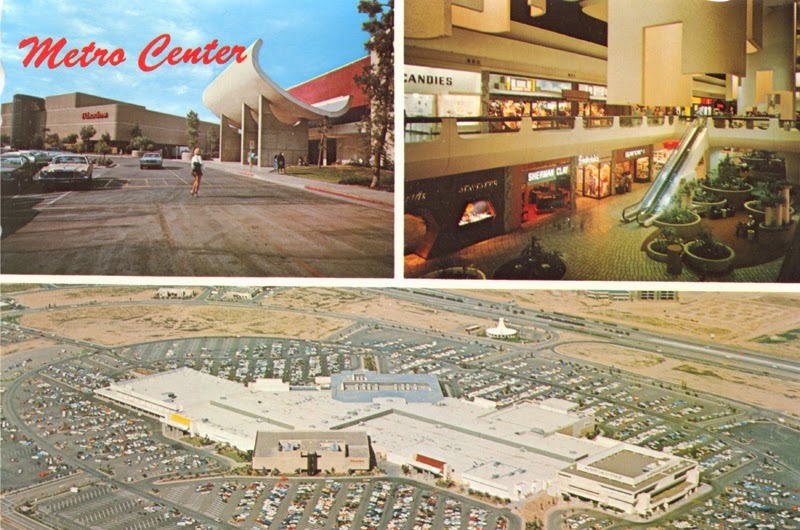 The first mall in Phoenix was Park Central Mall, which opened at the corner of Central and Osborn Road in 1957. It wasn't long before the Christown Mall followed in 1961, which was notable for being the first indoor, air-conditioned mall in the state. 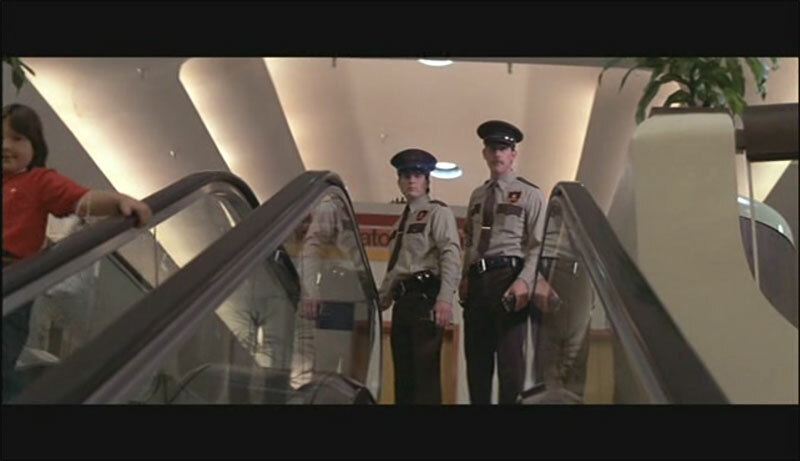 But the grandest of all was Metrocenter Mall, which opened in Phoenix in 1973. The mall was located in the northern part of town, just west of Interstate 17 between Peoria Ave and Dunlap Ave. It's worth noting that in the early '70s, I-17 only went up to about Camp Verde. It didn't connect to Flagstaff until 1976, and even then it was just a two-lane highway between Camp Verde and Flagstaff. 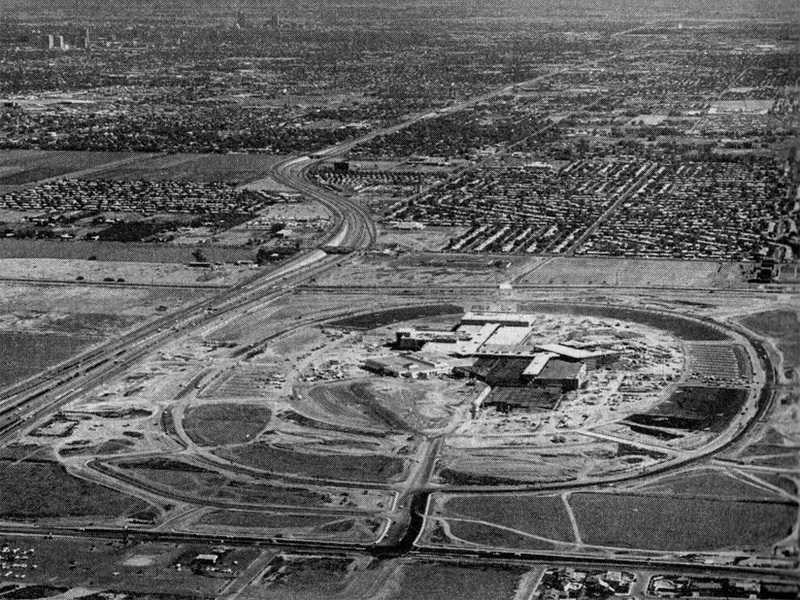 Metrocenter Mall under construction in 1972. Metrocenter was a record-breaker in many ways. With over 1.4 million square feet of space, it was both the largest mall in Arizona and the first two-story mall in Arizona. A $21 million dollar loan was granted to build the mall - the largest commercial loan in the state's history (up until that time). Metrocenter Mall in Phoenix, AZ. In the 1970s, a typical mall layout had 1 to 3 large department stores called "anchor stores" surrounded by smaller stores and restaurants. Metrocenter was unprecedented for having 5 anchor stores! The original five were Sears, Rhodes Brothers, Diamond's, Goldwater's, and The Broadway. Architect Robert Fairburn was inspired by Le Corbusier's Palace of Assembly in India. 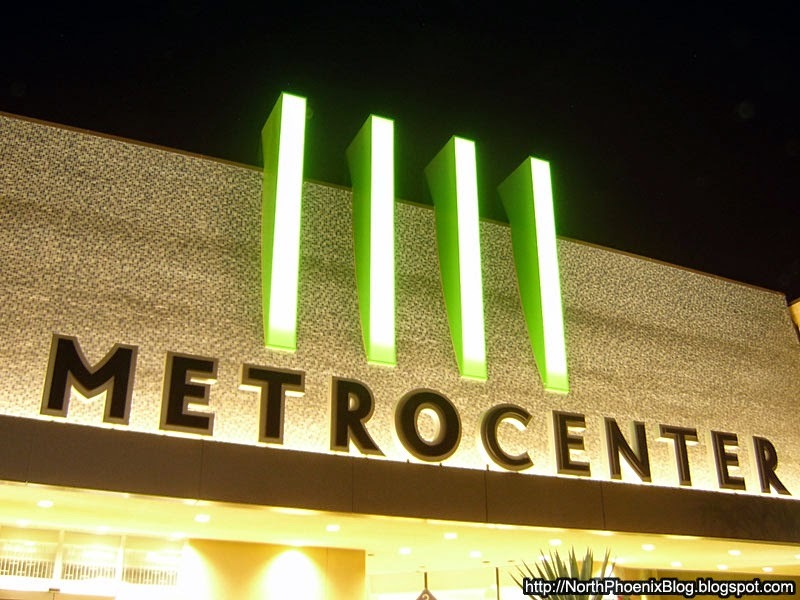 One of the features that made Metrocenter different from other malls was its unique appearance. Architect Robert Fairburn drew inspiration from Le Corbusier's Palace of Assembly in Chandigarh, India. Each entrance to the mall featued a large, upswept wave of concrete that seemed to defy gravity. These entrances fascinated me as a kid - I thought they looked like giant skateboard ramps! Metrocenter was a destination in itself, with an ice skating rink, arcade, and dozens of specialty stores all under one roof. It was a hotspot for families to come and enjoy the day in air-conditioned comfort. In 1976, the amusement park Golf 'N Stuff (now Castles-N-Coasters) opened in the southeast corner of the mall's parking lot providing 10 acres of rides and miniature golf. 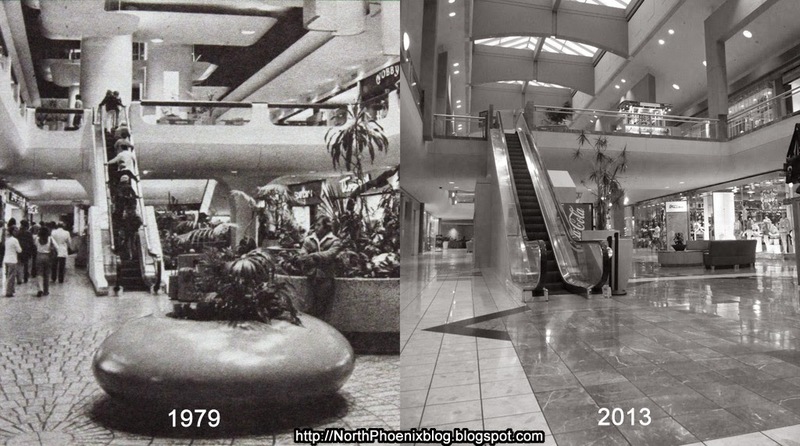 A then-and-now shot of Metrocenter Mall in 1979 and 2013. One of the smaller buildings on the perimeter of the mall was Western Savings and Loan (now a Souper Salad restaurant). This former bank is easily visible from the Interstate and widely recognized for its unusual architectural shape. 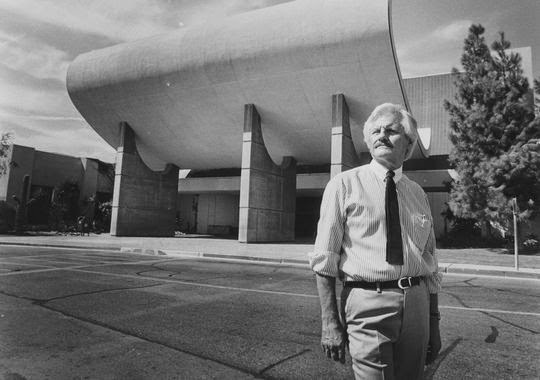 It was designed by architect Wenceslao Sarmiento, who also designed the Phoenix Financial Center (or the Punchcard Building). 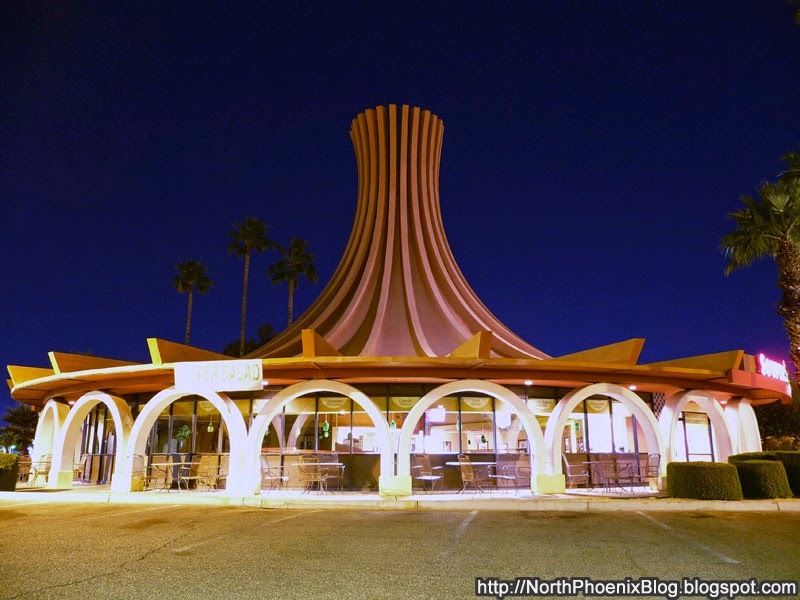 The former Western Savings and Loan is a well-preserved icon of 1970s architecture. 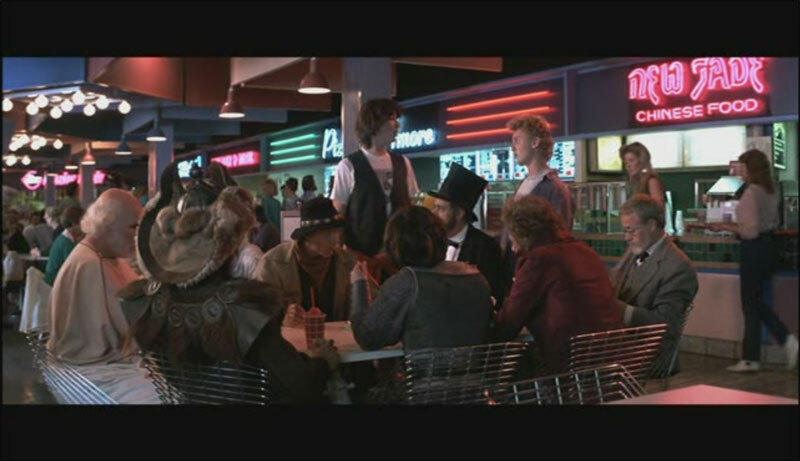 Metrocenter Mall made its on-screen debut in the 1989 film Bill and Ted's Excellent Adventure starring Keanu Reeves and Alex Winter. 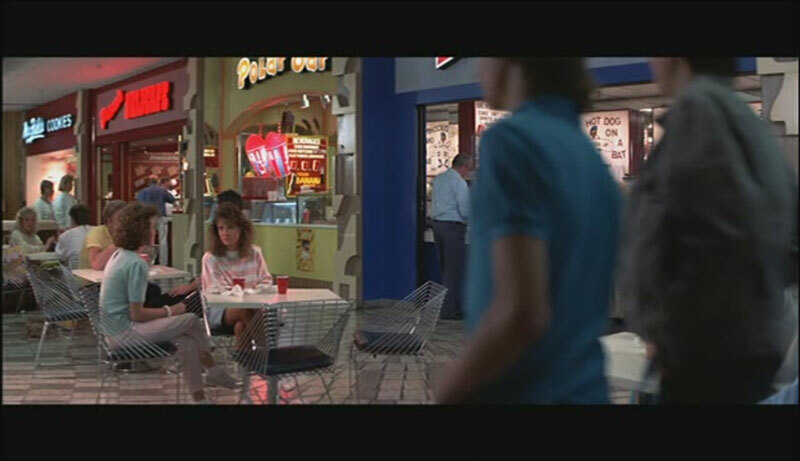 Key scenes of the film were shot on location at the mall, as well as other locations in Phoenix. 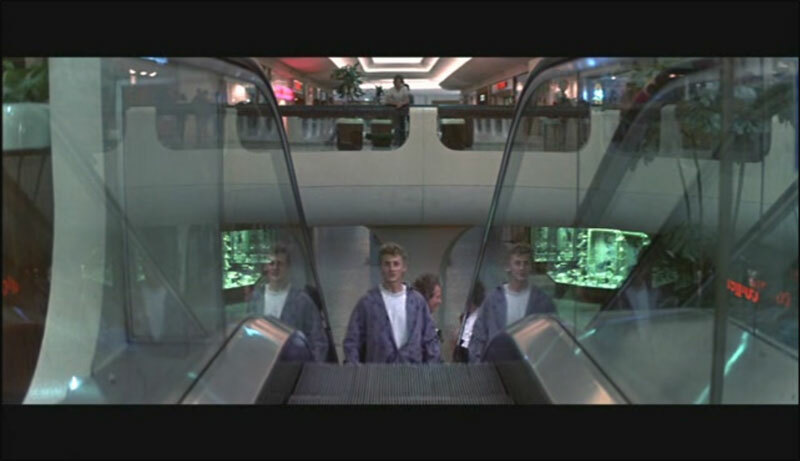 Sometime in the 1990s, Metrocenter mall began to fall into decline. The ice skating rink was closed in 1986. The mall saw some of its business siphoned off by Arrowhead Mall in Glendale, which opened in 1993. Metrocenter became known as a place of teenagers with sagging pants and a hotspot for petty crimes like vehicle break-ins. The mall took a major blow when Robinson's-May and Macy's merged in 2006, leaving one of the anchor stores empty. JCPenney left the mall in 2007, leaving a second anchor store open. The mall changed owners in 2004, in 2010, and again in 2012. In 2004, the new owners spent $32 million dollars to give the mall a facelift. They repaved the parking lot, added more lighting, and redid the landscaping. Sadly, those famous entrances were "modernized" by the time the redesign was done in 2005. Metrocenter Mall after the 2004 facelift. Metrocenter Mall may be down, but it's not out. As I mentioned in a previous article, serious efforts are underway to rejuvenate the mall. First, Wal-Mart announced in 2014 a plan to build a store at the south end of the mall, replacing one of the vacant anchor stores. This will provide jobs and will hopefully draw more shoppers to the area. Another boost to the Metrocenter Mall will be the arrival of the Valley Metro Light Rail, which is already in progress. The line is being extended north from 19th Ave and Bethany Home Road up to Dunlap Ave, with plans to cross the Interstate and create a transportation hub on the mall property. 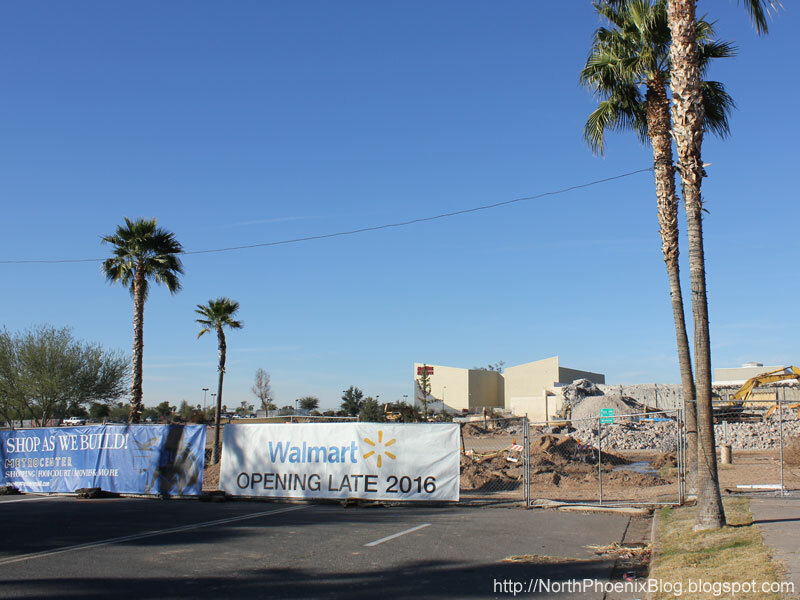 Dec 2015: Demolishing the old Broadway building to make way for Wal-Mart. 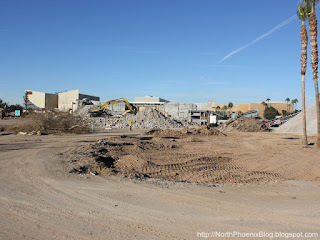 Image credit: North Phoenix Blog. Will these efforts be enough to revive the once-great mall? I think that if the mall and its owners can clean up the mall's tarnished image, it has a great chance at becoming a safe and profitable place that people can enjoy once again. The Walmart development in Metrocenter mall will hasten the trashing of neighborhoods to south of the mall. I have lived in the neighborhood for over 37 years. In its heyday Metrocenter generated an incredible amount of traffic. In the late 70s and early 80s traffic flow along 29th Avenue was unrestricted and the neighborhood was nearly inaccessible from Thanksgiving until after Christmas with shoppers trying to get to Metrocenter on surface streets. Thankfully, the city changed the traffic control at 29th Avenue and Dunlap, requiring north and south bound traffic to turn at Dunlap rather than flow freely north and south. This alleviated a great deal of congestion in my neighborhood. I fear that city leaders will change the traffic flow back to the previous configuration which will be a nightmare for my neighborhood. Black Fridays will mean I and my neighbors will have great difficulty getting in and out of our driveways, let alone trying to go somewhere other than Metrocenter. Destruction/construction has begun on the walmart store and, I fear, further trashing on my neighborhood. I really appreciate the outward-in approach to development currently happening at metrocenter. The rejuvenation of the outer mall loop and shops and restaurants along Peoria have really changed my outlook on the area. I hope to see continued growth at a once great location. Fantastic article. I only began visiting MC as far back as 1991 but I still saw it in it's prime. It was a fantastic venue. Seeing it remodeled to a completely bland interior now with only 1 department store hanging on is painful. Will always remember the better days. My late father worked on the dirt work of this mall when it was being built. A little side story about the architect and my father. The architect wanted it where you could enter the mall from ground level and be on the 2nd floor. Many said it couldn't be done safely. My father who supervised the dirt work said it could be done. My father finished the dirt work ahead of schedule and made it so the builders could build the center to the architect wishes. Because of this job my father was able to go into business for himself because it gave him a great reputation in his line of work. 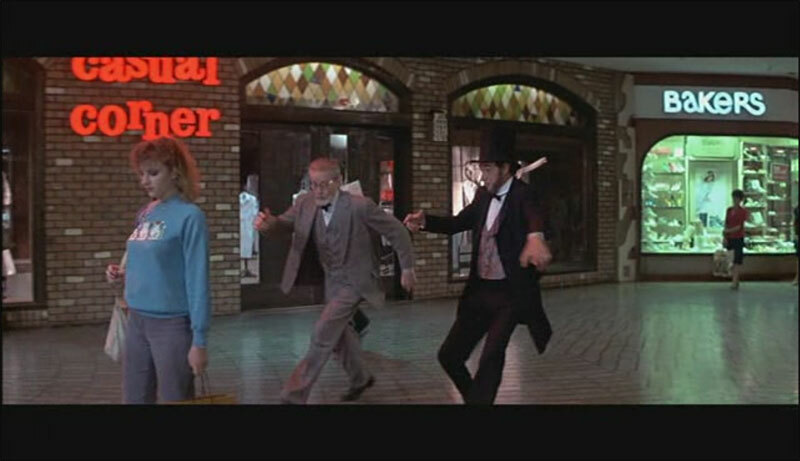 A screen shot from the film is visible at the Hollywood In Arizona Tribute Facebook page. The ice skating rink was there until at least 1987. That was the year I moved there, and it was the first time I went ice skating. It was still a really cool place back then. I spent my high school leisure time at the mal. 1973-1976.it was fabulous in its heyday! I went in there the other day, came out crying. It's gone way downhill! So sad! I too remember the beautiful mall at its best... late 1970-1992. We lived just a short walk away! I remember my brother and father worked at Pearle Vision. There was not only one Pearle Vision but two! One on the first level at one end and the other on the second floor. Back then each managed a store. Since then, my father passed away in Phoenix and I went through a awful divorce and moved back to Indiana. I always thought I would see it again. But not. Does anyone remember the name of the photography store upstairs?